The Deluxe ASB-3000 offers fully mechanical, adjustable stretch control for full range film stretch. Comfortable foam style handle. The EASB-2000 offers similar adjustable stretch control as the ASB-3000, but is lighter in weight and lower in price. Ribbed rubber handle. 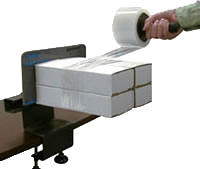 The Stretch Band-It™ Stand is a natural addition to any shipping room operation. Its design is simple. its uses are many. Mounts easily to a table, allowing quick unitization of multiple products. Combination shipping saves you money! Highlight's Band-It™ Stand together with the Stretch Bad-It™ give you a system that makes it easy to combine packages and cut shipping costs. Simply set the product(s) to be unitized on the Band-it™ Stand supports, take your Stretch Band-It™ and quickly stretch wrap them securely together. Bundled products are easily removed from the coated supports after wrapping. Quality construction for years of service. The Band-It™ Stand accommodates package weights to 35 pounds.